If you still can’t find the answer to your question after reviewing our FAQs below, please send us an email at service@plombco.com or call 1-800-611-7074. Why is it important to balance my tires? A properly balanced tire/wheel assembly on your vehicle is vital to maximizing the life of your tires. An accurately balanced tire/wheel assembly will give your vehicle improved traction and stability while driving and increase fuel efficiency. What are the symptoms of an improperly balanced tire? Vibration – the most common place to feel this is in the steering wheel while the vehicle is in operation. Excessive tire wear – uneven tread wear is often a sign of a tire/wheel assembly that is out of balance. Increased fuel consumption – if you find that your fuel economy has drastically decreased and you have any of the symptoms listed above it could signal you have one or more tire/wheel assembly out of balance. What is the proper way to clean a wheel for use with adhesive weights? It is important to use an alcohol based cleaner such as X4Bio. X4Bio does not leave an invisible residue that many cleaners leave. The invisible residue can greatly reduce the adhesion to the wheel. What states currently ban the use of lead wheel weights? 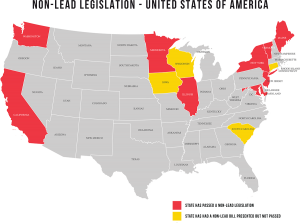 In May of 2014, Minnesota became the seventh state to ban the use of lead based wheel weights joining California, Maine, Vermont, Illinois, New York and Washington State. Where can I buy Plombco products?